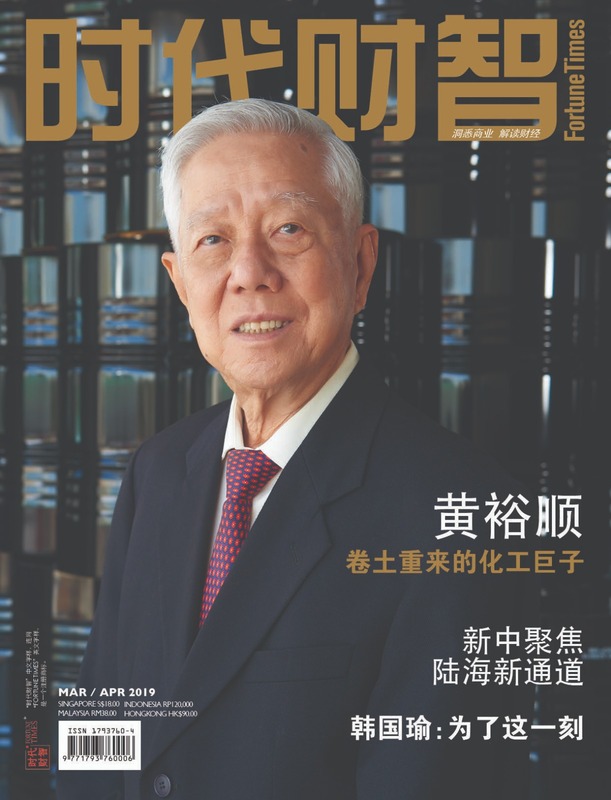 Two weeks ahead of the Singapore Yacht Show 2019 from 11-14 April, a Fortune Times reporter had a sea trial aboard Ferratti 920 — a highlight of the show — which has for the first time sailed to Singapore. The nautical giant, which is completely made in Italy, measuring 28.49 meters long, has a hull measuring 23.98 meters, which means it can be registered as a recreational craft. A major new feature involves raising the height of the bow. 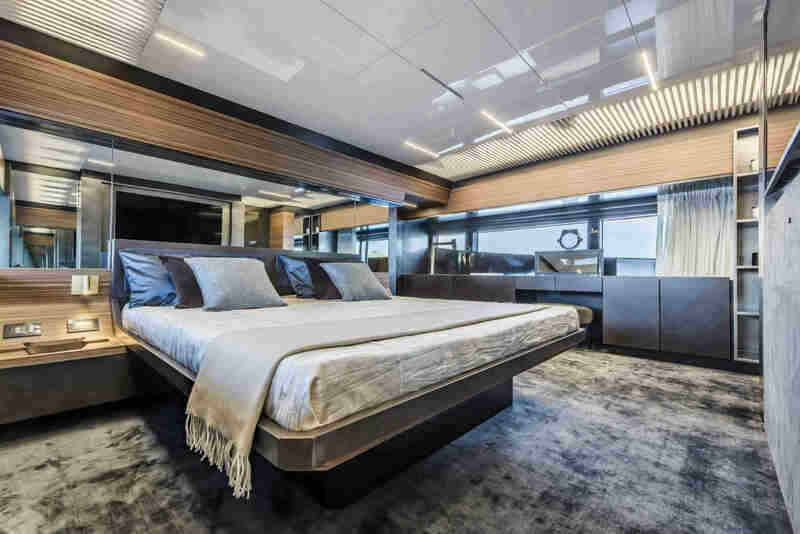 As well as giving the yacht an imposing presence on the water, this has allowed the addition of a wide-body master suite on the main deck. 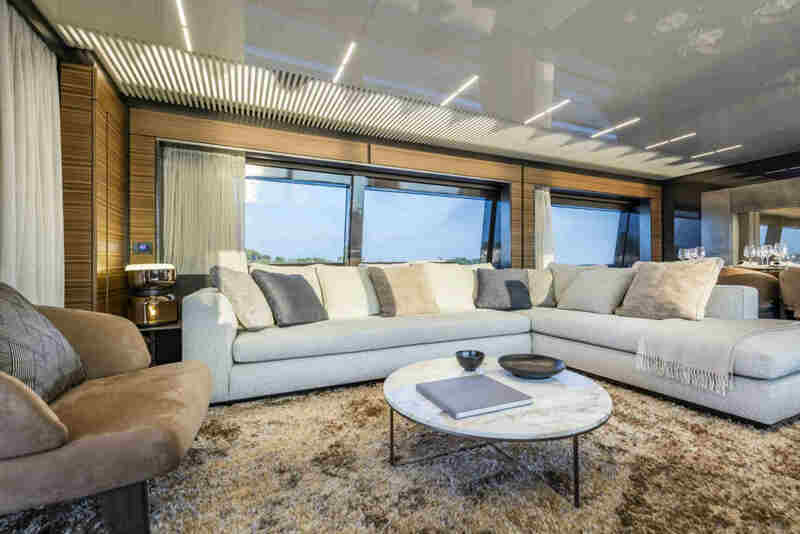 The detailing on the gunwale, which also helps to emphasize the yacht’s “aggressive” character, continues beyond the bulwark walkways, “cutting” into the design of the windows in the master cabin. Its exterior spaces offer a sufficient amount of space for relaxation as well as luxurious furnishings, both built-in and free-standing, the latter by the famous Italian company Roda. 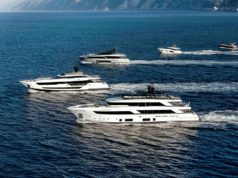 The space located forward, in particular, is the largest ever on a Ferretti Yachts vessel of this size. The sun pad on the bridge house leads into a dinette fitted with two forward-facing sofas – divided by a passageway – and a pair of sofas with adjustable backrests along the bulwark. This creates a large lounge, complete with coffee tables, which can be protected and shaded by sun canopies upon request. 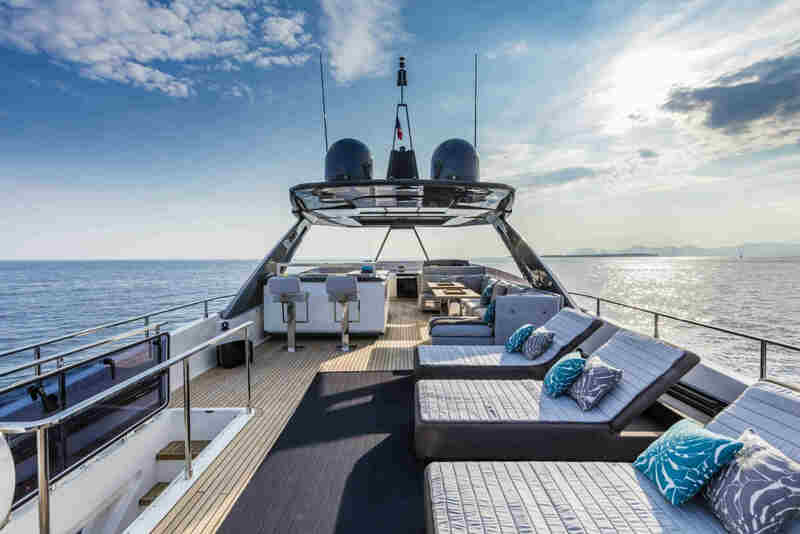 The cockpit features a multipurpose sofa, which can be used as a sun pad or as a seat for the outdoor dining table. The stern area features a Submersible Hatch, the system used to move the garage door and swimming platform, offering guests the comfort of a spacious beach club and allowing the crew to handle a tender measuring up to 4 m in length with ease. 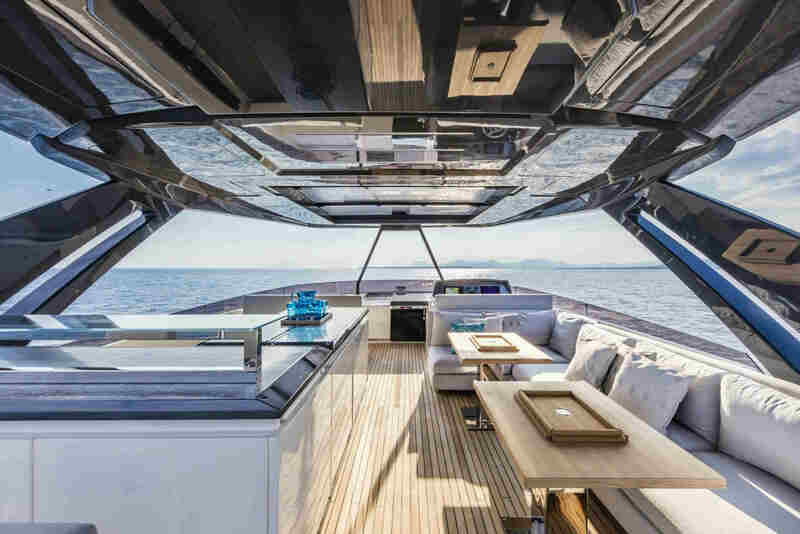 The flybridge, a panoramic deck designed for relaxation, especially amidships and in the stern, is another highlight. It is covered by a special blacked-out window situated over the dining area and outdoor helm station. The bar unit beneath, which can be configured to suit the specific needs of each owner, features a Florim top in travertine. Its interiors also rival the stunning versions in higher category models. The lounge, with its anthracite-grey parquet flooring, is paneled almost entirely in exquisite walnut wood with chocolate tones, alternating with enameled accents in different colors. The built-in furniture, upholstered in stone-grey leather, serves to complement the lounge’s furnishings as a whole, all of which are by Minotti, from the fabric-upholstered Powell sofa and coordinated Creed armchair in nubuck leather, to the Duchamp and Calder coffee tables, whose finishings in Bronze and Calacatta Gold blend elegantly with the rest of the room’s appointments. In the dining area, there is a table in the smoked grey glass with an enameled base, along with 8 Velis lounge armchairs, in nubuck leather, by Potocco, just another one of the wide range of optional features that Ferretti Yachts has to offer. A back-lighting system, provided along with the same ceiling panel lacquered in optical white that can be found in all of the craft’s main spaces, serves to complete the luxurious contemporary style of the lounge. Below deck, we find the same chocolate-tone walnut wood and enameled accents, alternating with fine leather and customizable upholstery. In the widebody master stateroom, the bed is supported by a recessed base that makes it appear as though it is “floating”, while above it a large mirror emphasizes the cabin’s generous size. Meanwhile, the expansive windows, covered by gathered curtains, provide a stunning view of the panorama outside. The furnishings include a vanity table and a walk-in closet. The full-beam bathroom is located at the foredeck, on a slightly lower level. 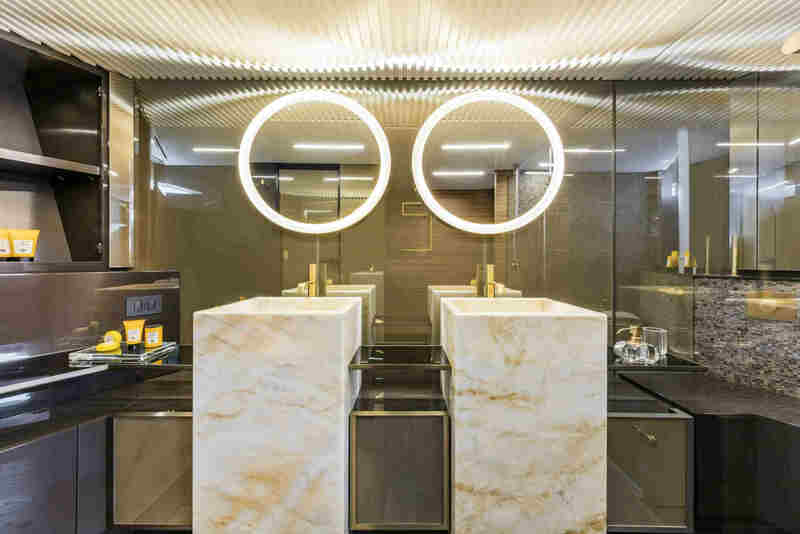 Parquet flooring, Antolini marble, mosaics, and brass accenting characterize this space, which is divided into three separate sections: one for the toilet, one for the shower, and another where the sinks are located, above which hangs an OmniDecor DecorFlou Bronze mirror. 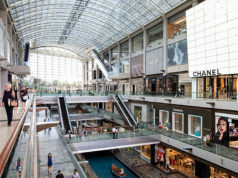 The central area of the deck is designed to control the circulation flows on board. There is a lobby to the starboard side with a companionway leading down to the lower deck, a large storage area, and a day toilet. On the port side is a large galley, all by Ernestomeda, from which you can go up to the helm station or out onto the exterior walkway. Continuing forward, there is the first technical and system monitoring area, beyond which is the companionway leading down to the crew quarters. Two layouts are available for the main area of the lower deck: the first unit includes 3 large en-suite cabins. 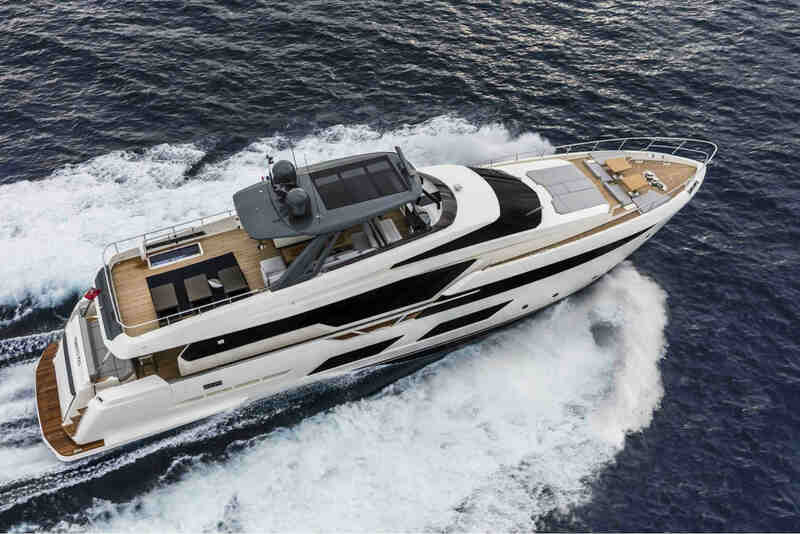 This exclusive layout allows the Ferretti Yachts 920 to offer guests a full-beam double suite amidships, worthy of being called a master cabin, and a second VIP suite on the port side with the exact same set-up. A comfortable third cabin with single beds completes the sleeping area. The furnishings in these cabins and in their bathrooms feature the same interplay of materials and colors as on the main deck, but with specific customized variations. The 4-cabin layout is organized into two en-suite double cabins on the port side and two doubles with single beds on the starboard side. Great attention is paid to the crew: in addition to a dinette with laundry area, the captain can enjoy a private en-suite cabin, while the crew can relax in two double cabins with a shared bathroom fitted with a separate shower. A second layout is also available for this area, with a captain’s cabin at the foredeck. 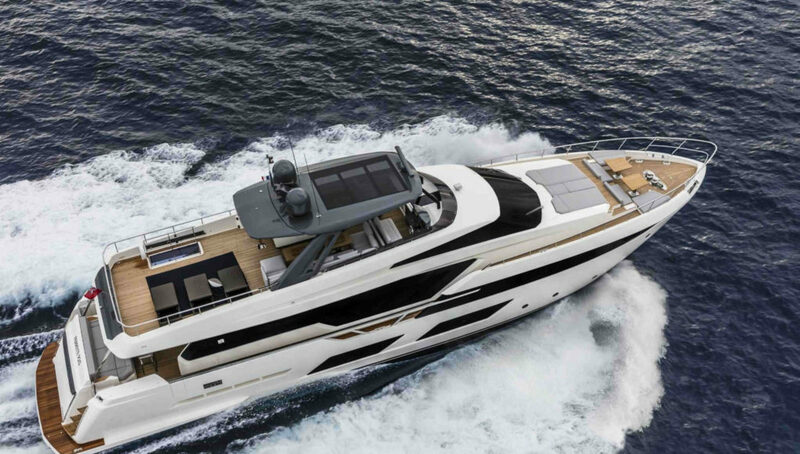 The pilothouse is an exclusively technical area with a ‘futuristic’ design. 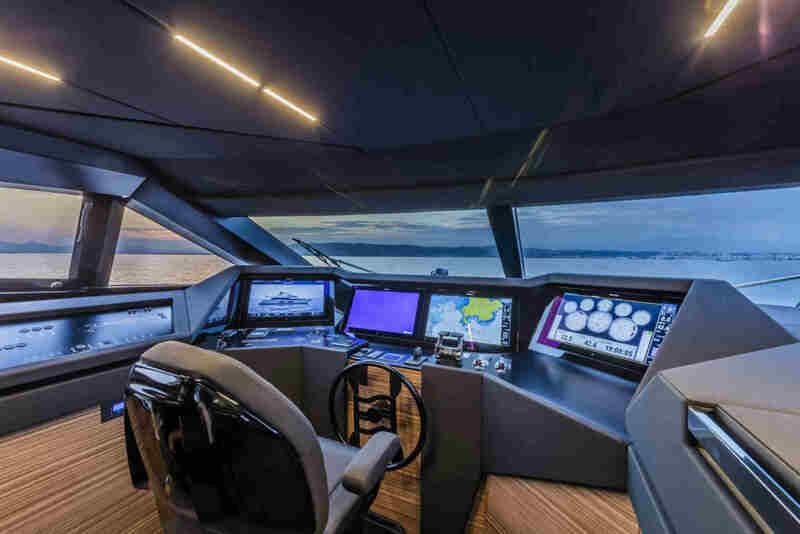 The captain can run the entire yacht from here, thanks to a large control station equipped with a next-gen steering system and multiple touchscreen displays that fully integrate all of the onboard monitoring systems and navigation instruments. 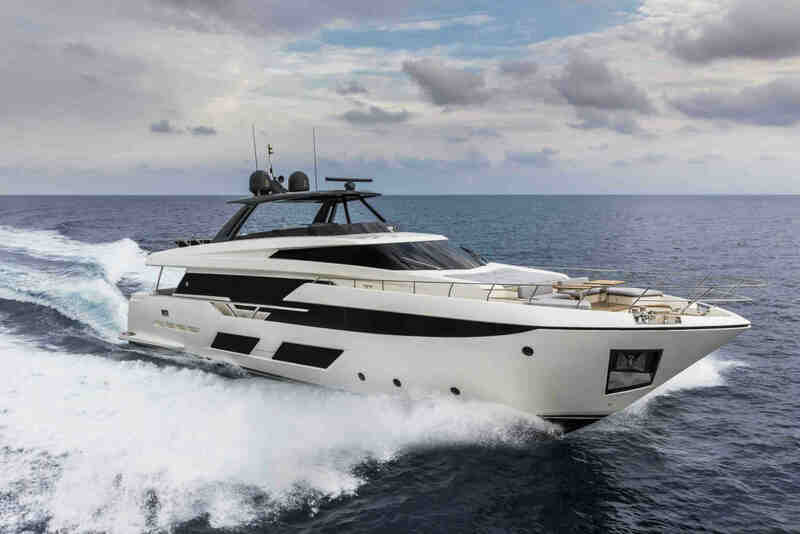 The Ferretti Yachts 920 is available with three different types of MTU engine. The first unit comes fitted with two 16V, 2000 M96 engines, generating 2435 MHP, allowing the yacht to reach a cruising speed of 26 knots and a maximum speed of 30 knots. It also includes zero-speed fins and Seakeeper stabilizers.